The urge to help deprived street children led to the establishment of Asha Kiran Shelters Foundation in 2007. For the past six years it has extended a helping hand to numerous orphaned, destitute and migrant children. The foundation’s primary area of focus being children, it operates ten Day Care Centers and a Shelter (Yashodhara residential Home and School) for children. The Day Care Center looks after the children of migrant labourers employed at construction sites under its Opening Education Pathways for Migrant Children (OEPMC) project. Yashodhara Shelter Home operates in collaboration with SAMPARC, an NGO with more than 20 years’ experience in child care, and supports around 200 children. So far, AKSF has helped 900-1,100 children through its Day Care Centers and Yashodhara project. Apart from its core objective, Asha Kiran also focuses on community development for enhancing the quality of life of the community at large. To achieve this, it conducts adult literacy programs, organises regular health checkups, and encourages formation of SHGs. Extending resources for advocacy campaigns and promoting public advocacy is also an objective of Asha Kiran. So far AKSF has reached out to more than 500 people through its community development program. Posted an income of Rs3.7mn in FY13 with Foreign Sources contributing to the tune of 71%, followed by Corporates (20%) and Individuals (6%). Income sources have shown an inconsistent trend with 100% of donations coming from Individuals in FY10 and Foreign Sources in FY11. Corporate donations of Rs0.7mn in FY13 are funds provided by construction firms for Day Care Centers at their construction sites. Major chunk in FY13 is contributed through foreign sources as AKSF is an Indian counterpart of AKSF, Spain which acts as fundraiser for the organisation. These funds are sourced on the basis of prior permission obtained in FY12 as FCRA registration of the foundation is under process. Foreign funding of Rs3.4mn in FY10 and Rs3.2mn in FY11 was raised through share capital and share application money. The share capital has subsequently become a part of the Corpus. Ambiguity on permission from the Ministry of Home Affairs and Ministry of Foreign Affairs for raising funds through share capital and share application money has resulted in payment of penalty of Rs0.4mn in FY12. 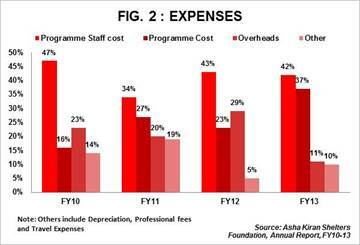 Expenses totaled to Rs3.4mn in FY13 with major expenses incurred on staff salaries for programmes (42%), followed by programme expenses (37%) and overheads (10%). Programme expenses increased to Rs1.2mn in FY13 from Rs0.6mn in FY12 as against proportionate decrease in overheads to Rs0.3mn in FY13 from Rs0.7mn in FY12. This indicates effective utilization of funds for direct expenses. Current assets have dropped from Rs2.4mn in FY12 to Rs78,000 in FY13. This sharp drop is on account of refund of security deposit and advance rent paid for rented premise of Yashodhara Shelter Home. Cash and bank balance has increased by about 5x from Rs0.1mn in FY12 to Rs0.6mn FY13. This increase can be attributed to deposits made for refund of advance rent and security deposit received in FY12. Income in FY13 has shown 100% growth as compared to FY12 on account of foreign funding of 2.7mn. This has resulted in surplus of Rs0.29mn in FY13 as against the deficit of Rs0.81mn in FY12. Y-o-Y income growth has shown an inconsistent trend on account of foreign funding raised through share application money in FY10 and FY11 and not considered as income for the respective years. Fundación Asha-Kiran, Spain, is the parent organization of Asha Kiran Shelters Foundation and is entrusted with the responsibility of raising funds for AKSF. However, as of now there is no certainty on receipt of foreign donations as the FCRA registration is under process. Self-sufficiency ratio has dropped sharply to 9% in FY13 as compared to 72% (ratio measures how much of expenses can be met from own income – individual donations/corpus income/fee income). This is on account of reduced individual donations from Rs1mn in FY12 to Rs0.2mn in FY13. AKSF has borrowed funds from its own members (Rs0.4mn) which account for 4% of total funds in FY13. Delay in receipt of FCRA registration resulting in lower availability of funds. Lack of resources for obtaining information on schemes announced by Government. Asha Kiran has members from diverse background on its board. It is an India Counterpart of Asha Kiran Foundation, Spain. AKSF follows a maker checker concept with the parent organization raising funds, monitoring and evaluating the projects and Asha Kiran, India, focusing on their execution and implementation thereby ensuring transparency and accountability in the organization. GuideStar India has accredited Asha Kiran Shelters Foundation for its transparency and accountability.